A suite of samples was collected from 3 pegmatite localities in the Grenville province. U-, Mo-, and REE-bearing pegmatites and skarns and veins in the central metasedimentary belt, Grenville province, Ontario. Samples were collected from the Goshen Uraniferous granite pegmatite, the Spain Mo-U skarn deposit and the MacDonald zoned granitic pegmatite. At 2 of the 3 locations sampled in this region, CO2 rich fluid inclusions are common in the pegmatite. There are also significant variations in the decrepitation patters indicating formation from a range of different fluids across the region and also within individual mines. Feldspar samples show much less or even no decrepitation and do not correlate with nearby quartz samples. 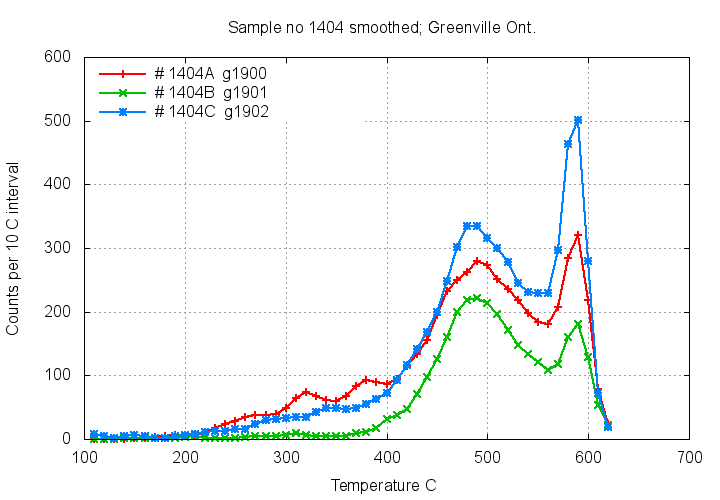 Samples from the Goshen U area showed normal decrepitation for quartz with no low temperature decrepitation and hence no CO2 rich fluids present. 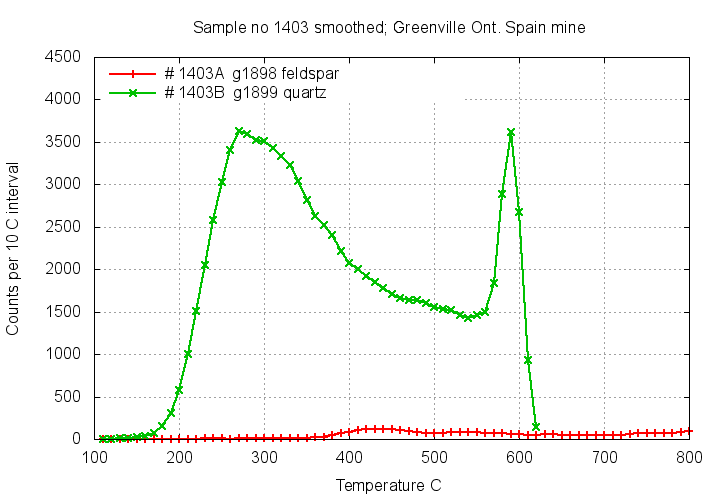 At the Spain mine the intense low temperature decrepitation indicates the presence of CO2 rich fluids in the quartz. But feldspar lacked any decrepitation and it is not clear why the 2 co-existing minerals contain such different fluid inclusion populations. The samples from the MacDonald pegmatite often contain CO2 rich fluids and show a low temperature decrepitation response. 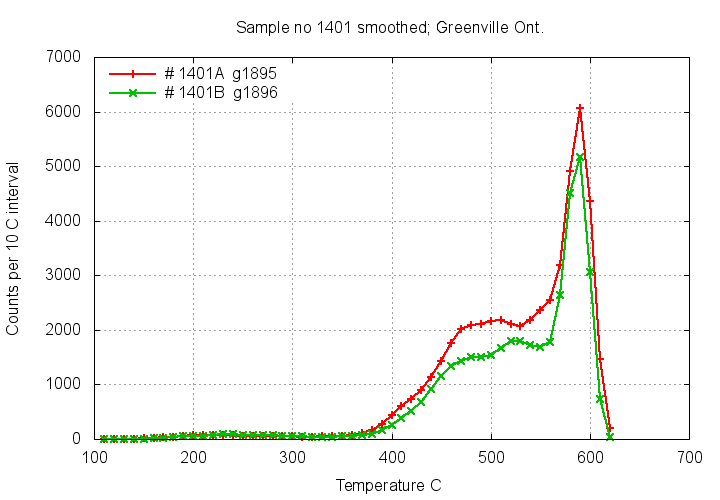 Samples 1404A and 1404B contain trace amounts of CO2 rich fluids. 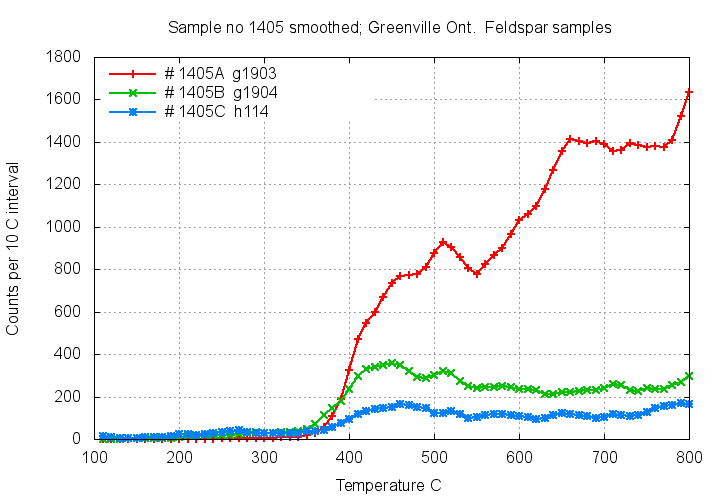 Feldspar samples from MacDonald show some decrepitation, but the temperatures do not correlate with quartz decrepitation temperatures at this mine. 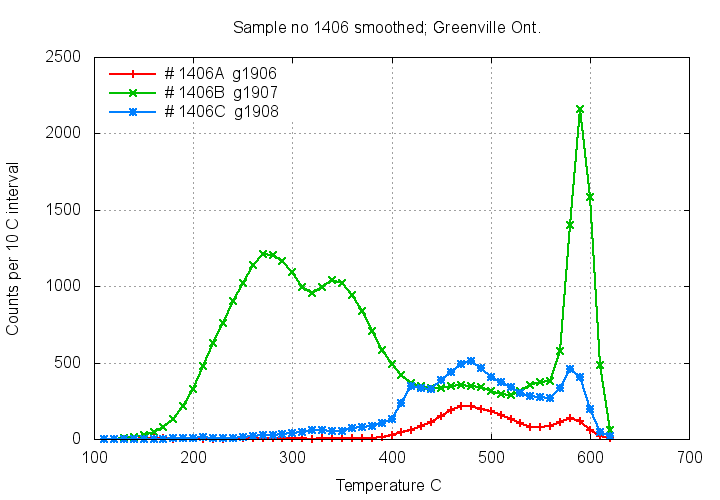 Sample 1406B (green) from the MacDonald mine shows particularly intense low temperature decrepitation due to abundant CO2 rich fluid inclusions. Other peaks occur at 350 C and 420 C as well as the more commonly seen peak at 470 C and indicate fluid variability during formation.